Product prices and availability are accurate as of 2019-04-15 23:13:38 UTC and are subject to change. Any price and availability information displayed on http://www.amazon.com/ at the time of purchase will apply to the purchase of this product. 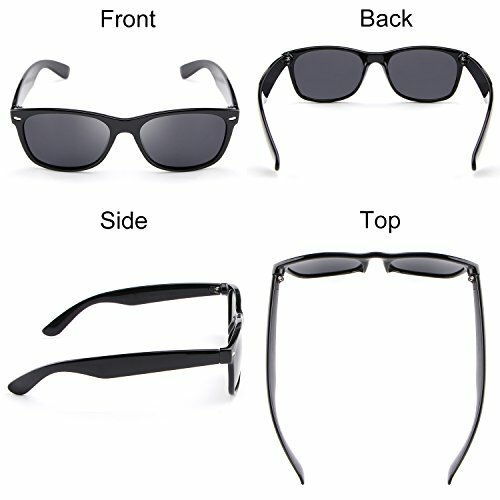 HDCRAFTER focuses on variety of functional glasses like UV400 protection polarized sunglasses, night vision glasses and sports cycling glasses. To provide fashionable and high-end quality products is our goal. UV400 protection lenses blocks 99.5 - 100% harmful UVA, UVB & UVC rays. 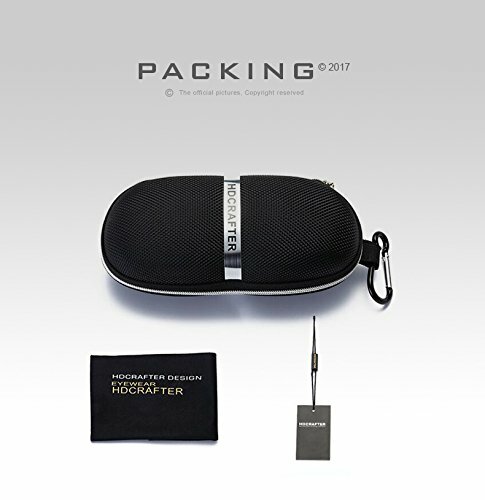 Package: Triple protection (anti-pressure hard case + paper card wrap + card box) make sure the sunglasses arrives at you without any damage. The gift package, making it a wonderful yet practical gift idea (such as christmas gift or birthday present) for friends and family! 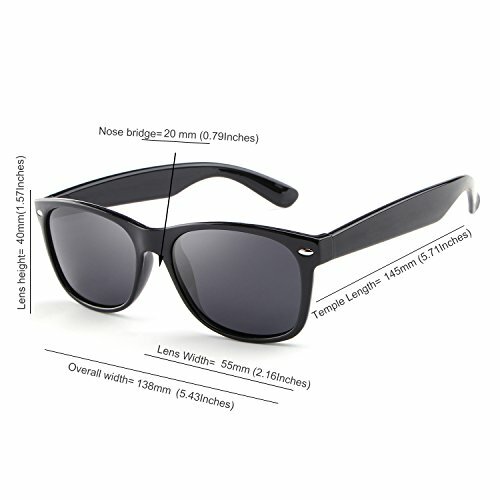 MEASUREMENT - The cheap mirrored reflective sun glasses have a measurement specification of Lens Height: 40mm (1.57 inches) Lens Width: 55mm (2.16 inches) Nose Bridge: 20mm (0.79 inches) Temple Length: 145mm (5.71 inches) Frame Length: 138mm (5.43 inches) LIGHTWEIGHT - The square wayfarer sunglasses are light-weighted for ergonomic wear and stresses free even when you put it on for a day long. The material of whole eyewear is made with plastic and composite so thees glasses are lightweight enough. 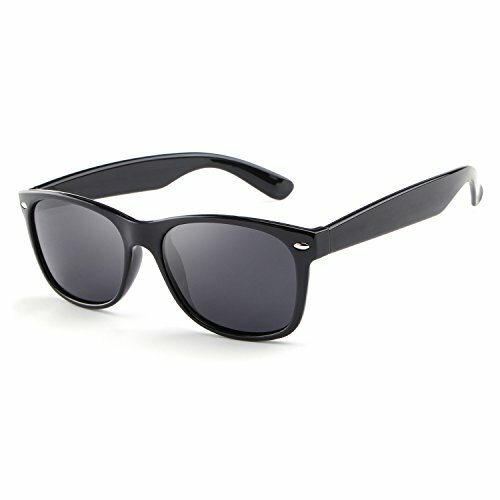 POLARIZED LENS - The vintage retro classic mens/womens polarized lens of UV400 are designed for your eyes health during driving at day or night, fishing, hunting, and outdoor sport activities to help prevent direct sunlight or other brilliant light from your eyes 100% by reducing glare by blocking reflection, UVA, UVB, UVC rays. Also, bifocal polarized sunglasses for men or women make images to appear clearer, increase your visual clarity and night vision to see clearly and for your comfort. 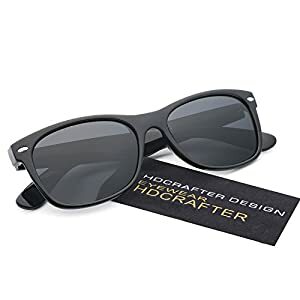 RISK FREE PURCHASE - All HDCRAFTER Sunglasses are backed by a LIFETIME warranty on frames and lens as well as a 30-Day Money Back Guarantee when purchased from authorized dealers. So if you are not completely happy with your purchase for whatever reason, we'll do whatever it takes to make it right.